I can hardly believe that summer has passed and school is already starting for most of the country. The weather is starting to turn and as I took a walk this evening I grabbed a sweatshirt to take off a little bit of the chill. Saying goodbye to swimming pools and late sunsets always brings a bit of nostalgia to me, cuz one more summer is in the books. But when I think ahead to one of my favorite fall treats, I get kind of excited and I forget about the beach all together! It’s time to shift gears, cuz ready or not…here comes fall!!! And nothing says fall like the comforting taste of pumpkin spice! It seems like once September hits, the leaves start to change color and suddenly pumpkin spice is everywhere. Pumpkin spice coffee, pumpkin spice ice cream, pumpkin spice cookies. I’m surprised they don’t make pumpkin spice toothpaste! Pumpkin is just synonymous with fall. Unfortunately, most of the mainstream offerings of this fall favorite are full of artificial flavors and all sorts of yuckiness. Ditch the questionable ingredients and whip up this healthy, delicious option at home instead. Pumpkin Pie Smoothie – Oh So Yummy! My family loves anything pumpkin, so one day I decided to try and make a pumpkin pie smoothie. Because the only thing better than eating pumpkin pie is drinking it! A straw straight to my mouth, connecting the pumpkin to my belly! YUMMY! My mouth waters just thinking about it! Hint: If you have a garden, be sure to scoop up as many pumpkins as you can now. 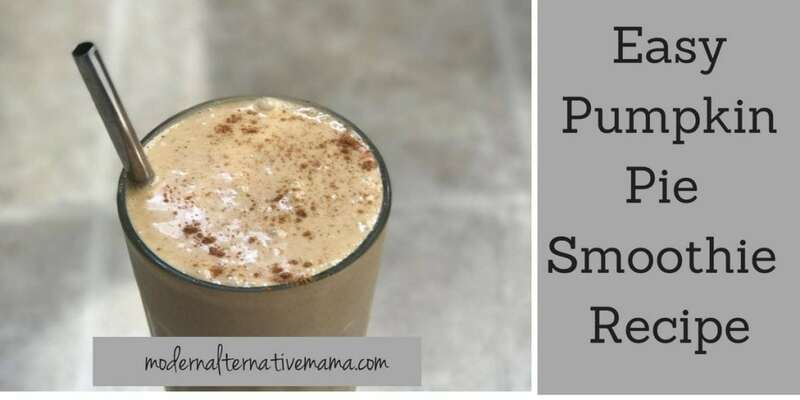 Cook them up in your pressure cooker and store them in your freezer because you are going to want them all winter long so you can enjoy my yummy pumpkin pie smoothie anytime you feel the ‘comfort food’ mood strike! And if you don’t have a garden, look for pumpkins at farmers markets or even your local supermarket. I have found that the jack-o-lantern pumpkins are every bit as good as the pie pumpkins and are usually much cheaper for MUCH more pumpkin! I’m telling you…You will WANT to keep pumpkin on hand! I know first-hand, cuz one time, my pumpkin ran out and, let’s just say, it was a sad day! My family has a lot of allergies so I created a non-dairy version of the pumpkin pie smoothie, but you could easily make it with daily milk as well. My kids are always standing by the blender hoping for seconds! Yours will enjoy it too, I’m sure! Next, you need good-quality pumpkin. I recommend using fresh pumpkin that you have previously frozen or finding some in the frozen food section at your local supermarket. If you absolutely can’t get either of those, then use a simple can of pumpkin. Just make sure its not pumpkin pie filling because that is packed with added sugar. Peanut butter is the secret ingredient that adds a hint of depth to your smoothie. It will make your smoothie feel rich and full-bodied. I like to use all-natural peanut butter with no sugar added, but that is entirely up to you! Of course you can’t have pumpkin pie, without pumpkin pie spice. If you don’t happen to have pumpkin pie spice on hand, you can use a recipe to make your own. You will need something to sweeten your smoothie, and I highly recommend the goodness of stevia. You could also use honey or dates, but I would suggest you stay away from using actual sugar. And finally you need ice. Ice just makes the smoothie a smoothie! It gives the added texture and volume and of course, temperature to make your smoothie taste delicious! Kick back with your Pumpkin Pie Smoothie and enjoy the snuggly weather! Before you know it, Christmas will be here and we’ll all be sipping egg nog! Step 1: Put all of the ingredients in a high powered blender and mix until smooth. Step 2: Divide evenly between glasses, add a straw and enjoy! Do you have a favorite fall smoothie recipe? How much spice would you suggest? I’m sorry! I missed adding it! I edited it to add it now, but I’ll tell you too! I use 1 tsp!